Rising Junior Devin Lane had another successful day at the ITA Summer Circuit event in Denver, Colorado on Sunday, as the Ute reached the finals in both singles and doubles. 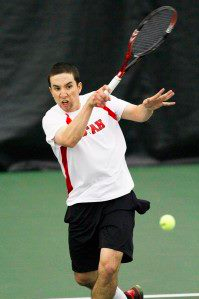 On a day full of tennis, Lane started the day with a win over Ali Rasvi (Air Force) in the quarterfinals 6-3, 6-2. In his second singles match of the day, the Ute beat Alex Clinkenbeard (Denver) 7-6, 7-5 in the semifinals. The No. 2 seeded Lane will face No. 4 seeded Mitch McDaniels (New Mexico) in the finals on Monday at 9.00am. In doubles play, Lane teamed up with fellow teammate Justin Archer to reach the finals after beating Conroy/Graham 8-1 in the quarterfinals and Kennedy/Rizvi in the semifinals 8-3. The Ute duo will face the winner of the semifinal matchup between McDaniels/Corona-Saunders and Clinkenbeard/Franz on Monday after completion of the singles final.